Ducati has given the Hypermotard range a complete technical and cosmetic makeover for 2019 with a host of changes aimed at both making it more rider friendly and also more exciting to ride. 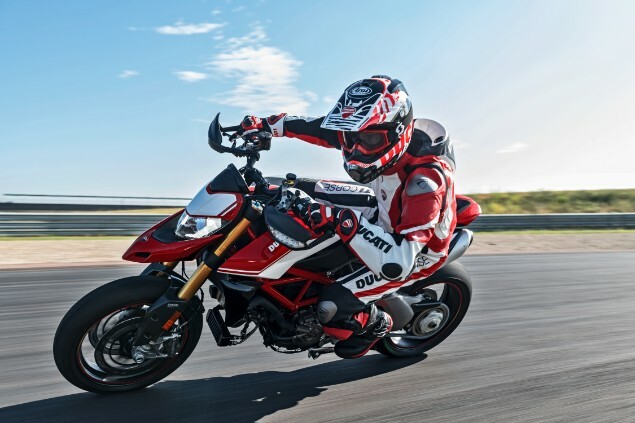 There are two 2019 Hypermotard models as us usual for Ducati with a standard Hypermotard 950 and a 950 SP model which has higher specification components as standard. The Hypermotard range dates back to 2005 when it was first shown as a concept bike but has been through a number of generations since then. This new Hypermotard 950 replaces the outgoing 939 model which was introduced in 2016. The first actual model year that went on sale was in 2007 when the original Hypermotard 1100 and 1100S were revealed. Some updates were then introduced in 2010 before a complete change with the introduction of the 821 model range in 2013. More updates were introduced with the Hypermotard 939 model range in 2016. 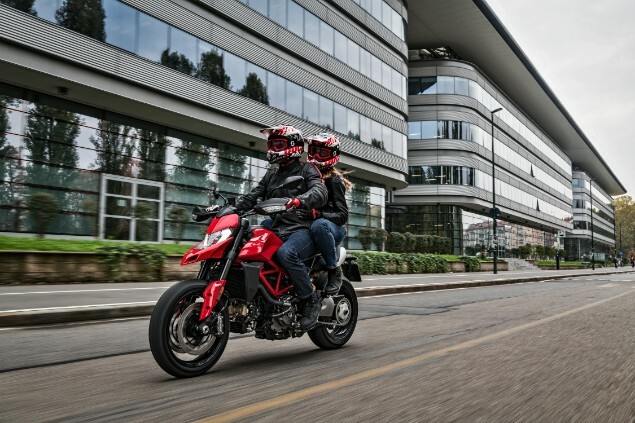 At the centre of the changes to the Hypermotard range is a new 937cc Testastretta 11 V-twin engine which generates more power and has new electronic control systems to give a smoother power delivery. Peak power is now 114hp at 9000rpm with a peak torque figure of 96.1Nm with 80% of that available at 3000rpm. 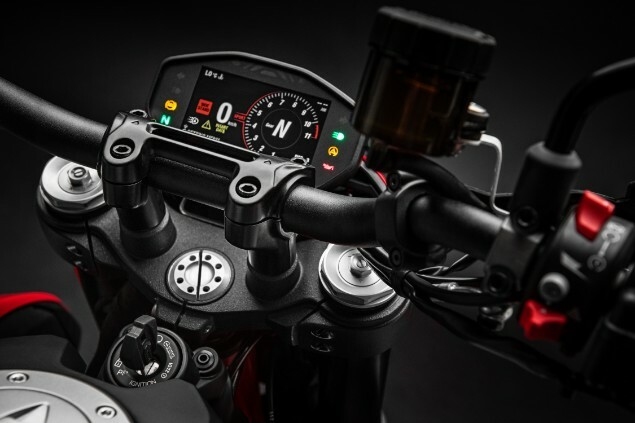 Governing the new engine is a Bosch 6-axis Inertial Measurement Unit which works to detect bike’s yaw, pitch and roll angles and then works to control the cornering ABS, traction control, wheelie control and quickshifter. Three riding modes are available as standard with Sport, Touring and Urban modes all adjusting throttle response, power and the intervention level of the ABS and traction control along with the wheelie control. Overall a weight-saving campaign by Ducati has taken 4kg off the overall weight of the Hypermotard model range. 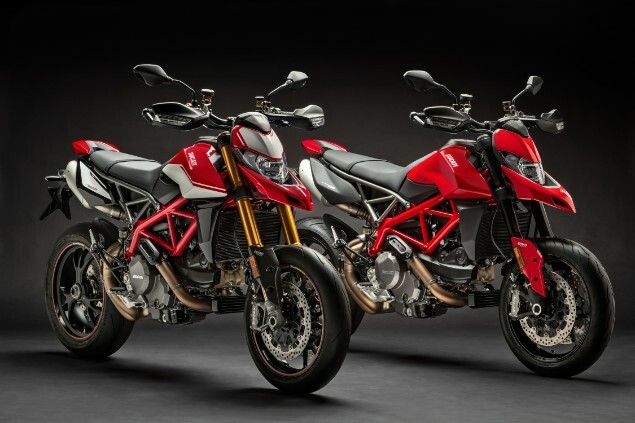 What’s the difference between the Hypermotard 950 and the 950SP model? The biggest change, beyond the different graphics different black wheel rims, are the fully-adjustable 48mm Ohlins forks and Ohlins shock absorber with forged Marcheshini wheels are standard on the SP model. There are also carbon-fibre components like a front mudguard and engine belt covers and Pirelli Diablo Supercorsa SP tyres on the SP model. The standard Hypermotard has 43mm Marzocchi forks and a Sachs shock, cast aluminium wheels and Pirelli Diablo Rosso 3 tyres. Ducati has worked hard to make the new Hypermotard more accessible and some of this can be seen in the tapered subframe that allows for a narrower seat and a 53mm shorter inner leg curve measurement.